The Eastern spiritual traditions have always emphasised the core importance of the Heart in relation to the human soul, consciousness and God. The seat of the Self, they say, resides within the Heart and from this center the whole world arise. But to really understand the significance of this statement, in the context of the holofractographic universe theory, we must go beyond just its symbolical meaning. If we look to the medicinal teachings of the east, transmitted to us through the ancient Upanishads, we find that the human body is invariably viewed as an expression of subtle energy or prana (from the Sanskrit root “full”). Central to these schools are the etheric, or in our case, hyperdimensional topology of the body’s energy field. This field is often described as a rotating torus with vortexes entering at the crown of the head and the bottom of the spine, spiraling through the spinal column creating seven nexus points, or whorls of focused energy, called chakras (Sanskrit for “wheel” or “turning”). These nexus points are said to be vortices of subtle energies flowing through the body, transferring energy and information between the physical and “divine realm”. In the Upanishads the various chakras of the human body are also associated with different geometric symbols, signifying each individual chakra’s connection to a specific element. Modern science has recently discovered that the heart emits very high levels of radiation. In fact it is now known that the heart is the largest generator of electromagnetic energy in the body, and measurements reveal that the frequency of the heart’s energy field is 5000 times stronger than that of the brain! This field moves at the speed of light and extends up to 12 feet around the body, unimpeded by organic tissues. This alone should compel us to reconsider the role of the heart within our body. The HeartMath Institute has found that negative emotions of stress, anger or frustration are associated with erratic and incoherent patterns in the heart’s rhythm, whereas positive emotions of love and compassion leads to smooth, coherent ones. They have also discovered that changes in the heart’s rhythmic coherency, creates corresponding changes in its electromagnetic field. High coherency (positive emotions) generates smooth sine-wave like patterns, making the field more organised. Incoherency make it more asymmetric and disorganised. Neurocardiologic research has shown that the heart communicates with the brain in several ways: neurologically (transmission of nerve impulses), biochemically (hormones and neurotransmitters) and biophysically (pressure waves). Now we have evidence of direct, coherent energetic communication through electromagnetic field interactions as well. Using electrocardiographic (ECG) and electroencephalographic (EEG) instruments (for meassuring heart and brain waves) it has even been scientifically verified that when two people are in proximity of each other the “heart field” of one person affects the brainwaves of another! Not only is the energy and information flowing through your heart’s energy field transmitted throughout your body and brain, but it interacts with other people as well, communicating your internal state to the envirnoment. Taking these meassurments into consideration with the Holofractographic model describing the universe as embedded black hole singularities it becomes not so unreasonable to suggest that our heart may contain its own singularity at its core, and accordingly a topology of a dual torus creating a powerful electromagnetic energy field surrounding it. Interestingly it is a known fact that the body looses a certain amount of weight upon its death, again suggesting the presence of a gravitational curvature in the space-time continuum permeating the body. 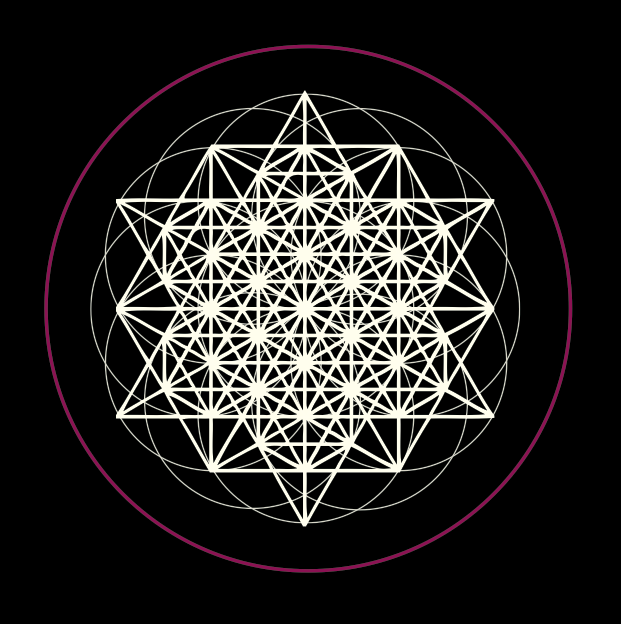 It is interesting to note that ancient texts suggests that we have a hyperdimensional energy field around the body in the implosive geometry as well, assuming the shape of a star-tetrahedron. This generates quite a different scenario in which the Heart is like a biophysical Sun in the solar system of our body. The singularity of the heart keeps the system alive, while radiating energy throughout the body and gravitating the system towards wholeness, organisation and order. As we have seen, the cells of our body are actually billions of mini black holes, spinning at the speed of light. Yet the singularity of the Heart may be the crucial fractal resolution through which these billions of smaller cells stay organised and coherent relative to each other. Without the Sun the solar system disintegrates. In the same way the Heart may be the sustainer of the bodily form, keeping it coherent and alive. What we call “death” may only be this black hole singularity of the Heart changing frequency (scale resolution), and the consquent disorganisation of mini black holes comprising the body. Yet nothing is lost as energy is continuously recycled through the vacuum state. The singulairty only reorganise to other frequencies of the Cosmic Symphony. The dual-torus topology of space-time may also provide us with a mechanical basis for understanding consciousness, where our perceptions and the sense of self arise as information flows into vacuum singularity. If this is the case, the seat of Consciousness may well be found to originate from the Heart and not the brain, again echoing the ancient teachings of the east. If we have within our own heart have infinite curvature towards Cosmic Singularity and oneness with the Infinite then, truly, our heart is the Heart of God. Both intuitively and culturally we treasure the Heart, and quite instinctively we refer to it as the seed of life and soul. Our science however has been drawn to the complexities of neurons and grey matter in the brain and, perhaps prematurely, declared it to be the seat of our self aware being. Now, as this chasm between our science and intuition can heal, we may reclaim our rightful place in the Heart, and gravitate back towards our God-given state of oneness and unconditional Love.